CORNELIUS, N.C. – February 11, 2019 – Today, VectorVest announced the release of Super WatchDog, a unique, personal alerting system that identifies stock buying opportunities based on VectorVest’s stock screener, MACD and Support and Resistance scans, even when you’re away from your computer. Super WatchDog generates alerts based on VectorVest’s built-in searches, including MACD crossovers and breaking and retracing from Support and Resistance. With over 500 dynamic stock screens running minute-by-minute and a complete set of backtesting and paper trading tools, a scan is available for a wide variety of traders. Here’s a real-world example. On January 25, 2019 a VectorVest Super WatchDog Alert indicated “BRS met the criteria at $3.79 for Percent Daily Boomers at 10:00AM ET. The stock was purchased at $3.84 at 10:01 AM. By 11:01 AM the stock was sold at $4.23 for a 10% profit. The stock went as high as $4.88 that same day, however, the buyer had an 11:00 meeting and chose to sell. Users can select to receive alerts via text or email and can adjust alert sensitivity per stock. VectorVest RoboTrader integrates with Super WatchDog and VectorVest Mobile, allowing users to act on trade alerts from their mobile devices. 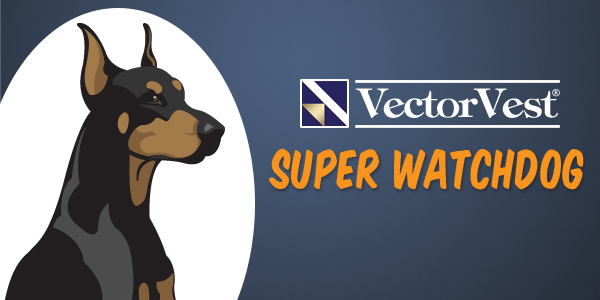 Super WatchDog brings a new, expert level of alerting functionality to the VectorVest family of products. To learn more, visit www.VectorVest.com/SWD. Providing the highest quality investment research for 30 years, VectorVest’s comprehensive approach to investing combines the insight of fundamental valuation with the power of technical analysis in an easy-to-use stock analysis software package for all types of investors. VectorVest provides a Buy, Sell or Hold rating for over 19,000 stocks each day based on its proprietary Value, Safety and Timing system. VectorVest analyzes markets in the U.S., Canada, Australia, U.K., Western Europe, Singapore and Hong Kong. Visit www.vectorvest.com.